Hey, friends! It’s Morgan Noel. You usually see my here on the blog when I’m doing The Dog Blog, but today I am taking a turn at Day in The Life. I have a pretty busy schedule, what with training Chocolate Chip for Junior Regional Dog Agility Championships, but I managed to take notes throughout the day of what I did – so here you go! 8:00 AM: Time to get up! Chocolate Chip wakes me by licking my face and rubbing my arms with his paws. If I’m lucky, I can take a quick shower before Crystal demands the bathroom for one two three hours. Chocolate Chip sits next to the shower the entire time. 8:30 AM: I feed CC his breakfast – dry dog food – and then feed myself – granola with coconut milk, since I’m lactose intolerant. After Chocolate gobbles down his food, he lays down at my feet and looks up at me expectantly. Unfortunately, granola is not the most nutritious food for canines, so I feed him a small doggie bone while I wash my dishes. 9:00: Before I start school, I take CC on his morning walk. He sniffs every stop sign and bush along the way, informing all of the neighborhood dogs that he’s passed through here today. 9:30 AM: Schoolwork time! I usually start with history. Today I read aloud to Chocolate about Aztec kingdoms. He stares up at me the entire time, listening intently. 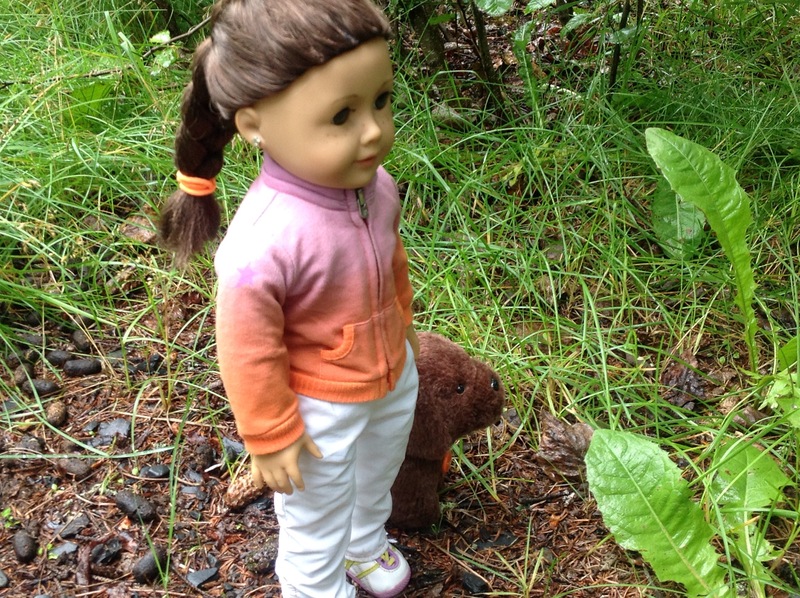 12:30 PM: After three hours of schoolwork, CC and I head out on our noontime walk. This time, we go to the neighborhood park, which is occupied by several parents and their not-yet-old-enough-for-school children. Chocolate Chip is always a big hit when we come here. Little kids really like animals, that’s for sure. 1:00 PM: Back to the schoolwork grind. I finish up a report I’m doing on modern-day service dog training, as well as taking a math test. Finally, I can get to the fun part of my afternoon! 2:00 PM: Chocolate and I head out to the backyard, where CC’s agility course is waiting. To get warmed up, we review basic commands such as sit, stay, speak, and heel. Then, Chip and I practice the A-frame obstacle. Chocolate Chip always gets a bit nervous when he goes on it, so we practice until he can make it up and down without balking at the top. 4:30 PM: It’s my day to cook dinner. Crystal, Lindsey, McKenna, Emily, Molly, Tessa, and I take turns making dinner every day of the week. We don’t trust Grace with sharp knives, so she’s relegated to making dessert every day. 5:30 PM: I serve dinner and we all discuss what we did during the day. Emily, Tessa, and Lindsey went for a hike. Crystal forced McKenna to go to the mall with her (poor McKenna!) Grace and Molly practiced their French together. After dinner, Graces serves us raspberry and kiwi tarte tatin. 7:00 PM: I feed CC dinner and then we go on our evening walk. 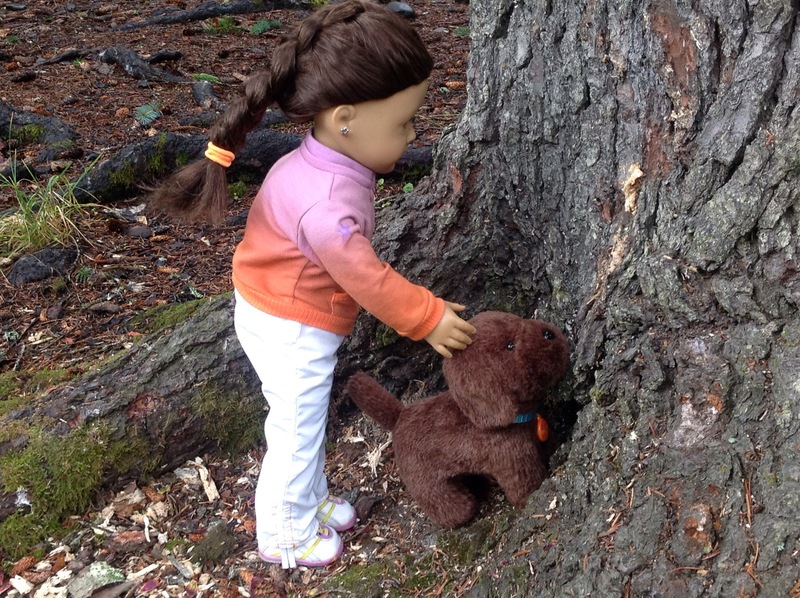 I bring Tessa with me – I’m trying to get her used to dogs. She didn’t have one back in Alabama. After the agility fiasco last week, I don’t think she really wants to hang out with CC and me anymore. She still has a small bruise on her forehead. 8:00 PM: I enlist McKenna and Grace to help me give Chip a bath. They’re the two most dog-friendly girls in the AGIA family. Chocolate is a fan of getting wet, but he’s so big that it takes forever for one person to bathe him. The girls and I rub him down with buttermilk doggie shampoo, and then rinse him off. CC keeps barking at the water coming out of the showerhead. 9:00 PM: Chocolate Chip and I get ready for bed. I pull on my pajamas, brush my teeth, and wash my face, and then CC and I climb into bed. Chip puts his head on my pillow and falls fast asleep. I stay up for a little while longer and read a chapter of my new book on agility training before turning off the lights. See y’all in the morning! Ahh! Finally! Part 2! I am so sorry it took me this long to get the photostory together – especially because it took like 15 minutes to take the photos and I was kinda putting it off because I wasn’t sure what to do. I got a lot of requests for specific dolls you wanted Tessa to “shadow.” I decided Tessa would shadow Morgan for Part 2, but since Morgan is only into dogs I wasn’t sure how to make this work . . . please tell me what you think about Part 2 in the comments! “Uh . . . sure,” I say. I’m not a huge dog person – not that I would ever tell Morgan that – but it’s not like I have anything better to do. “Weave,” Morgan commands Chocolate Chip. He begins to weave in and out of the plastic cones. “Good boy,” Morgan praises him. “Balance,” she says next, as CC hops up on a beam. Chocolate Chip jumps up and over the beam. “I guess so,” I say, leading CC over to the cones. “Weave,” I tell him. The dog just stands there, looking confused. “Weave,” I say a bit louder. Chocolate Chip weaves through one cone and comes to a complete halt. “You have to lead him. He won’t do it by himself yet,” Morgan informs me. “Right,” I say. I lead Chocolate to the other side of the line of cones. “Balance,” Morgan corrects me gently. Chocolate Chip, hearing the voice of his usual handler, hops up onto the beam and walks across. I stand behind the jump, confindent I can do this the right way. “Jump,” I say in a strong voice. Hey guys, it’s me, Crystal. I’m taking over “da blog” to share with you what a typical day looks like for me. I’m not very good with blog intros, so I’ll just get on with it. 7:00 AM: Brrrrring! I awake to the sound of my very annoying, very loud alarm clock that literally has you shaking when you wake up. It’s not a good feeling, but I’m stuck with that stupid clock. Grrrr. 8:00 AM: It’s off to the kitchen to get myself some breakfast. I typically like to have toast with raspberry jam, pancakes, or a fruit smoothie. What I don’t like to have? OATMEAL. 8:30 AM: It’s time to start school. I am homeschooled, so I do all my work in the office in my house. Fortunately, it has a door that locks, so I can have some privacy. I like to start out with my favorite subject, French. Grace helps me practice my French quite often, as she has been to Paris. I would love to go there someday with her. Grace and I get along quite nicely, because we have a lot of the same interests. Like France, French, and things made with sugar. 11:00 AM: I’ve been doing schoolwork for several hours now, so I take a quick lunch break and go for a walk. I take Morgan, Coconut, and Chocolate Chip with me. Morgan talks my ears off about dogs and agility training the whole time, but I don’t really mind. The leaves are bright orange and sticks crunch under my feet as we walk along. It’s very peaceful and nature-y. 12:00 PM: I get back to schoolwork. I only have a couple of hours before we leave the house for our afternoon activities, so I have to work quickly. 2:00 PM: Emily, Molly, McKenna and I head to gymnastics practice. McKenna is the only one who does gymnastics, but we like to watch her and her friends do their cool tricks. McKenna only falls off the beam once during the whole practice. She’s very pleased with herself, so I give her a big hug once she has washed the chalk off of her hands. I do NOT want to get THAT on my clothes. 4:30 PM: As the oldest in the family, it’s my responsibility to have dinner ready for everybody. Tonight I’m making a beef and veggie stir-fry. It’s all-natural and very healthy. Plus it tastes good, so i’ts a win-win. 6:00 PM: Molly, who, believe it or not, is the second-maturest in the family (next to me of course, despite the fact that she’s also the second-youngest) helps me with the dishes. I wear rubber gloves so the hot water and dish soap won’t ruin my nails and skin. 8:00 PM: I take a bubble bath (again, I have to yell at Lindsey to just GET OUT) and read a fashion magazine. 9:00: I pull on my pajamas, brush my teeth, and climb into bed. It’s been a long day, and I have to get up tomorrow and do it all over again. Crystal, out. Morgan: Hey, everybody! What’s up? It’s Morgan here on the Dog Blog. 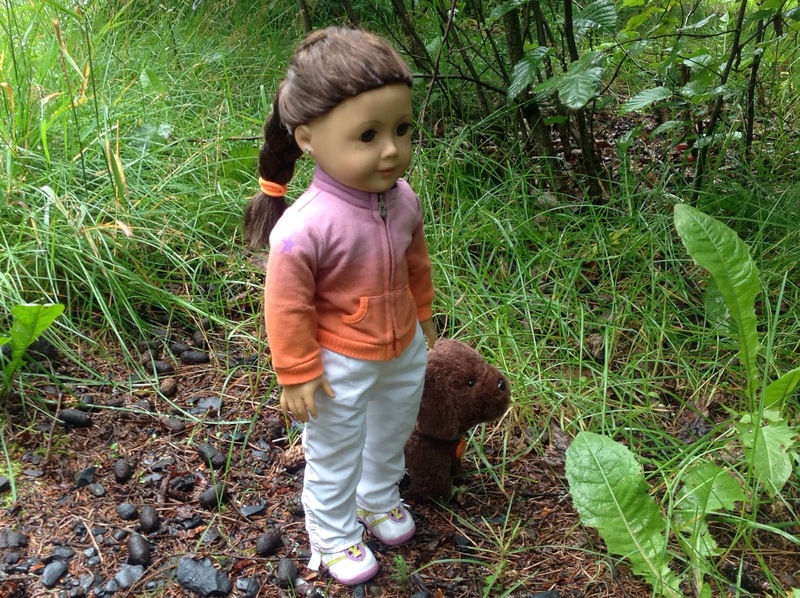 The Dog Blog is a brand-new thing here on American Girls in Alaska. 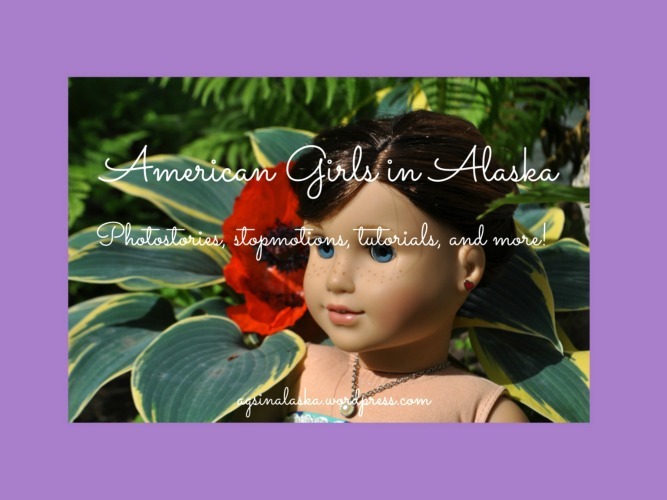 It’s where I interview the AGIA (new acronym for American Girls in Alaska) family dogs. I’m pleased to announce that the very first dog I’ll be interviewing is my own one. Please welcome . . . Chocolate Chip! 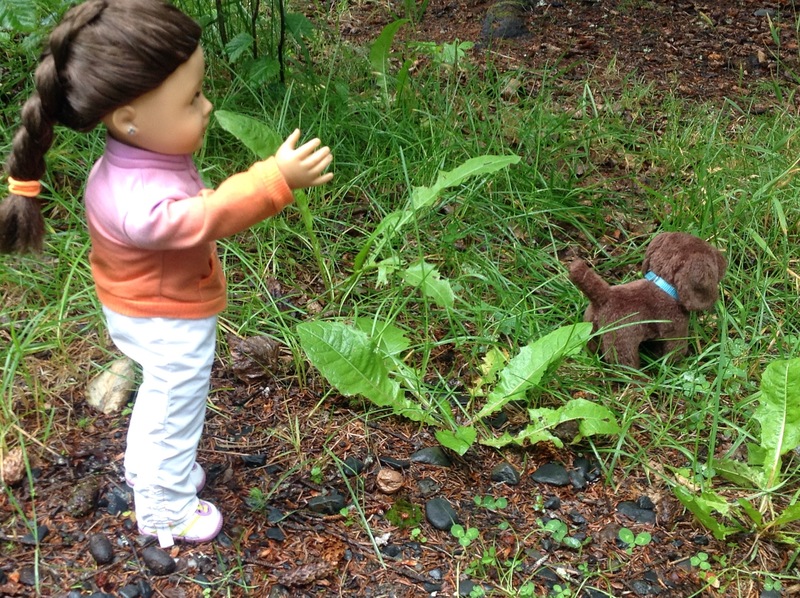 Morgan: Chocolate Chip – or Chocolate, if I may call you that – how does it feel to be the very first dog interviewed on American Girls in Alaska? Chocolate Chip: It’s an honor. I’m very pleased that I was selected. Morgan: Chocolate Chip, lots of our readers here might not know much about you. Can you tell us more about yourself? Chocolate Chip: Of course, Morgan. My main love is helping my human friends – I’m trained as a service dog, as you can tell by the vest I wear. When I’m not helping, I like to play fetch in the backyard – for a yummy chicken-flavored treat, of course. Morgan: Of course. Now, Chocolate, I promise I’ll keep this totally confidential from all the other dogs, but is there a particular friend you have in the AGIA family? Chocolate Chip: If I had to pick, it would be Cooper, McKenna’s dog. All of the other dogs are so small, so I can’t play rough-and-tumble games without somebody – and it’s never me, of course – getting hurt. Cooper likes the same things I do: fetch, treats, and going for walks. We’re best buds. Morgan: If you had to choose between walks and fetch, which one would it be? Chocolate Chip: Fetch, of course. We Labrador Retrievers love running toward that flying green tennis ball, picking it up in our mouths, and racing back to our owners to be rewarded with a pat on the head, a “Good Boy!” and another chance to chase the ball. Morgan: Now, Chocolate Chip, I know that this may be a strange question, but how would you describe your owner? Chocolate Chip: You’re really fun to play with, and I love that you love me and all the other dogs so much. I really appreciate all the time you spent training me to be a service dog. But you do sometimes skimp on the treats. Morgan: Now, Chocolate Chip . . .
Morgan: Okay, okay. Good boy. I love you too. That’s all we have for you today, folks. Stay tuned for the next edition of the Dog Blog. It’s August 21, 2017. An ordinary Monday, but then again, not really. Today is the day that the first total solar eclipse from coast-to-coast in the United States since 1979 will be happening. And the next one is in just seven years, which is very soon, considering total solar eclipses are usually far apart. And with our special glasses, we’ll be able to look directly at the sun! But not for more than a minute at a time – we have to rest our eyes so they don’t get damaged. In addition to loving animals, I’m also interested in the solar system and eclipses and the stars and things like that. This is a big day for me. I slip mine over my glasses and look up at the sun. The moon isn’t covering it yet, so it just looks like a bright, round ball up in the sky. I avert my eyes so they don’t get hurt. I don’t want to spend too much time looking up at the sun when the eclipse isn’t even happening here yet. A couple minutes later, Lindsey and I look back up. I gasp. I can see the edge of the moon covering the sun! “Wow!” Lindsey shrieks. That’s awesome! Chocolate Chip barks up at the sky. Lindsey and I grin at each other and laugh. After resting our eyes again, we look back up. Even more of the moon is covering the sun, making the sun look like the moon at night, like roles were reversed. “That is so cool,” I say. I’ll never forget this day, or the amazing eclipse. Seven years from now, I’ll look up at the next total eclipse and remember this one. Half an hour goes by, with Lindsey and I periodically checking the sun. It’s now at its peak for Alaska. The right side is almost completely covered. This makes me grin. Lindsey and I start packing up our stuff. And we head for home. How did you guys like that photostory? Unfortunately, it’s not as cool as I would like it to be, because a) I took the pictures with my mom’s iPad, b) it was raining, c) I felt very pressured for time because I didn’t want to get the iPad very wet, and d) the dolls are wet in the pictures. So there you have it. I promise my next photostory will be better. However, I’m glad my first one could be about such a memorable day. Did you guys watch the eclipse? If so, what was it like for you? It was too rainy here to see it, so we watched it on TV.